Pamper your child by getting this trendy bodysuit and let your child be the apple of everyone's eyes. The round neck and sleeveless design make it a relaxed wear while the bird embroidery makes it attractive. 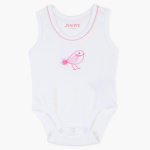 Features : Sleeves less bodysuit made of 100% Cotton for your little one delicate skin.